23-Jan-2016 -- As I was in southern California for three weeks, and as my work there was at Esri and therefore immersed in geotechnologies, I considered a confluence point hike to be the perfect complement to my stay in the region. Plus, it would get me out of the office for a bit, and into the field, which I am always teaching about and advocating. Thus I set out on a grayish but pleasant Saturday morning. Rain was predicted, which is always welcomed in this region, but nothing was falling, nor would it fall on this day anyway, and during my three week stay, it rained for only one afternoon. I drove east from Redlands on I-10 on County Line Road, which, going up the hill to the east, contains at least 12 four-way stop signs in just a few miles, so it is slow going but still a fine drive. No matter how many times I have visited this point, there is always something unexpected. The last time I was here, I noted that all of the approaches from the east were now through people's private lots and thus closed off, unless you were to ask the landowners' permission. The only one remaining was a trail leading from a road north of Beaumont, southeast of the point, which was a long hike. So, today, having only 90 minutes set aside for this adventure, I resolved to hike to the point from my tried-and-true method from the northwest. But as I drove slowly up County Line Road past the fence to the south, I could not find the trail access point, only signs indicating No Trespassing. I was perplexed. I had just turned around, heading back down the hill, and was considering the much longer hike from the other access point, far to the southeast. At least I saw it: A sign indicating trail access that pointed the way to the south. Whew! I parked, gathered supplies, and set out. And as I hiked down the ravine and up the other side, I encountered another surprise: The fields here had all recently been completely scraped of rocks and shrubs. It looked completely different from my other visits from the west side. I hoped it wasn't because houses would soon be built here: I wanted the area to remain open. Over the past decade since I have hiked here (and indeed this was my 10th anniversary year of visiting this location), more and more houses have been constructed: Indeed, the gated community to the southwest of the confluence now has made that whole side unapproachable. 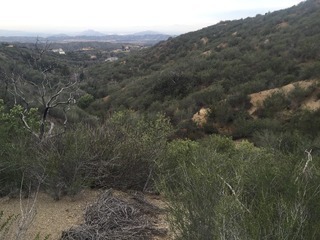 It was a beautiful area - always a bit smoggy toward Los Angeles, admittedly - and I didn't blame folks for wanting to live here, but I just hoped that hikers would still be able to get to these beautiful chaparral ridges. I exited the trail at the appropriate time, first hiking a bit higher to enjoy the view, and was just about to zero out the GPS receiver when I, as usual here, lost some satellites. The receiver led me south to the ridgetop, then back in a wide circle to the bottom again, when I finally had to give up and call it good enough. There are only a few times over the past decade when I have been able to zero out the unit. I am not sure that the geocache I found here once is still here, but I did not see it this time. As always, the ground was steep and slippery and I had to take much caution. I saw no people, no hikers, but I did see a few birds, and enjoyed the morning with the temperature standing at about 15.5 C (60 F) with only light winds. I hiked down a different way and took a few wrong turns, which surprised me since I have been here so many times. However, I eventually ended up back down in the scraped fields. I had only hiked a bit over 2 miles, so I added another mile in the adjacent neighborhood to the north, which was pleasant, but I marveled at the differences in scrambling around the thorns just 30 minutes earlier versus walking on firm concrete here! Human modification of the landscape: A perfect example. My round trip hike time met my goal of being at 90 minutes. Indeed it was the perfect complement to my stay in Southern California! Get out there onto the landscape. #1: Confluence of 34 North 117 West, in the foreground, looking northwest at the great view. #2: View to the north from the confluence. #3: View to the east from the confluence. #4: View to the south from the confluence. #5: View to the west from the confluence. #7: The newly scraped fields, looking toward the confluence, to the right center, up the first ridgeline. #8: Joseph Kerski at the confluence point wearing Esri GIS cap. #9: 360 degree panorama movie filmed at the confluence point with sound (MPG format).